Patron of: Abandoned Children, Charity, Orphans, Nurses, Slaves, Convicts, Prisoners. Born into a peasant family in Gascony, France, Vincent de Paul was an exceptional student. Assigned by his order to attend to the spiritual needs of French royals, Vincent’s life as a priest would present him with vast contrasts. While on a journey he was unexpectedly taken prisoner by Turkish pirates and sold into slavery. When he converted one of his slave owners, he was released, and on his return to France, founded numerous charitable organizations dedicated to the needs of prisoners, orphans, and the poor. These organizations were the first of their kind and still thrive today. Because he improved the lives of so many of them, he is especially called on to protect children who have been abandoned by their families. Vincent de Paul was ordained a priest at the age of nineteen. Staying in Toulouse, he made a voyage to Marseille to claim an inheritance. Upon his return by sea, he was kidnapped by pirates and taken to Tunis. After being enslaved by three different owners, he returned to France in 1607 upon his last owner’s conversion. As a parish priest in Paris, he came in contact with some of the wealthiest and most influential families in France. In 17th century Europe, the poor, the orphaned and the abandoned were all considered of the same invisible class as convicts. Seeing the face of God in these forgotten people, he used his numerous connections with the upper classes to help tend to their needs. Vincent de Paul introduced a much needed concept of Christian compassion to society by forming the Daughters of Charity. This organization gave pious wealthy women a way of serving the poor. Financial donations poured in, and Vincent started “Servants of the Poor” and “Ladies of the Poor”, each charity devoted to either the sick, the orphaned, or the imprisoned. Vincent encouraged peace between Protestants and Catholics. Offering refuge to exiled Catholics from England and Ireland, he also ordered his missionaries in the French countryside to respect and help out any needy Protestants. Though he was frequently welcomed by the King and Queen of France, his first devotion was to the poor and he used his royal audiences to obtain state funds for his many missions and hospitals. Vincent de Paul worked tirelessly until his death and it is said that he did more than any other person to relieve the burden of the poor in the seventeenth century. 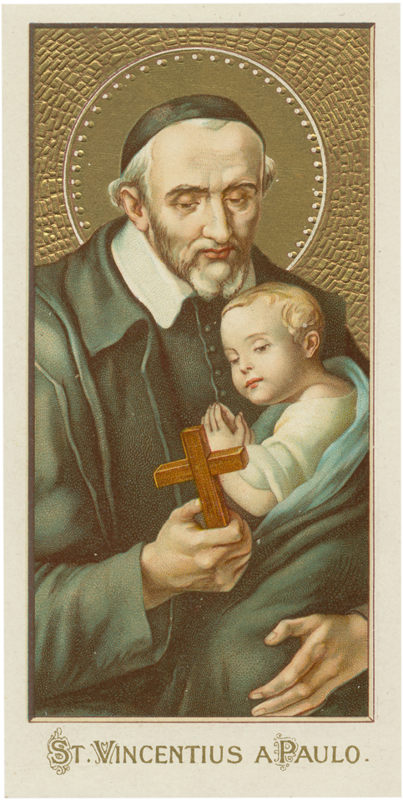 God you were patient with St. Vincent de Paul as you moved him from self-centeredness to be centered on you. Help me through his intercession to grant me this petition and to know that you will grant what I desire in your own time (your intention here) . I thank you God for everything and I will imitate St. Vincent de Paul in growing in holiness through prayer, participation in the sacraments and service to my neighbor especially the poor. This entry was posted in Healing, Health, Novena, Prayer, Saints and tagged charity, children, orphans by sandra dipasqua. Bookmark the permalink.